An exciting, free, nonpartisan event for pastors, their spouses, and all other church leaders! Light breakfast, and lunch provided! Imagine the echo of Amazing Grace—the prayers of godly men and women—the Gospel openly proclaimed in Arkansas’ most prominent place—the State Capitol Building! 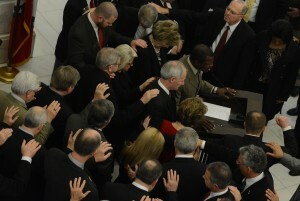 You can be salt and light by joining hundreds of pastors from all over Arkansas in the State Capitol Rotunda from 8:30 a.m. to 12:30 p.m. on April 27th for PASTORS DAY AT THE CAPITOL. This nonpartisan event will focus on worshiping God, praying for our leaders, ministering to those in authority, fostering better relationships between you and your legislators, practicing responsible citizenship, and learning how your congregation can do the same. Be encouraged, empowered, inspired, and informed. Be a witness for Jesus Christ through prayer, praise, and worship in the Capitol Rotunda. Fellowship with like-minded pastors from all over Arkansas. See lawmakers debate bills and pass laws, and learn how the legislative process really works. Learn how you and your church can fulfill the biblical mandate to pray for those in authority. 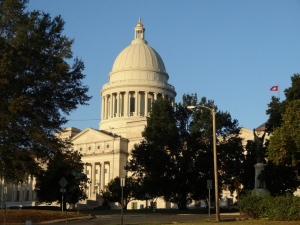 Get to know some of Arkansas’ leading policy makers. Meet Governor Asa Hutchinson, your state legislators, and other high-ranking state officials. 8:30 Meet and greet fellowship over a light breakfast with special guest Governor Asa Hutchinson. 9:00 Join with hundreds of pastors and elected officials for a prayer and praise service right in the rotunda of the State Capitol. What better place for a worship service! 9:45 Assemble on the front steps of the Capitol for a huge group photo of all the pastors and church leaders along with our elected officials. 10:00 Choose a breakout session. Visit a legislative committee hearing, tour the capitol, learn how a bill becomes law, go on a prayer walk around the Capitol, or go with experienced leaders to stop by various state offices to pray for whomever God directs. If you’re more “free-spirited,” you can launch out on your own and let God guide you in being a witness in the most important place in Arkansas—the State Capitol. 11:30 Lunch will be provided. This will be a great opportunity for you to visit with your state representative and state senator in the Capitol Rotunda. Tours and a few activities may last until 2 p.m., but feel free to leave after lunch if you need to get back to your church for Wednesday services or other obligations. Our State Capitol needs a godly influence. Pastors, their spouses, and other church leaders can bring this life-giving influence! You can be a part of this historic event. Please join God’s people at the Arkansas State Capitol on Wednesday, April 27, 2016. To register for this FREE event, click here or call 501-375-7000. We will register you and your group if you email us the name, address, and phone number of every member of your group. Contact: Charisse@FamilyCouncil.org Pastors, spouses, and other church leaders are welcome! On Sunday, Doritos aired a Superbowl ad depicting an unborn baby on an ultrasound screen reacting to a father waving a Doritos chip. Now, to be fair reactions to the ad have varied even among pro-lifers. Some pro-life commentators have praised the ad; one pro-life writer called it “a bit tasteless,” but as many have pointed out, if there are problems with the ad, “humanizing” the unborn baby shouldn’t be listed among them. After all, if an unborn baby is not a human being, then what is it? The filing period for candidates to run for office in Arkansas ended earlier this week. Altogether 219 candidates filed for President, U.S. Senate, U.S. House, State Senate, and State House. Below is a list of all the candidates that filed for these offices.